GoodReads Summary: Imagine exploring the most extreme parts of our amazing planet—trekking though the driest desert, climbing the snowiest mountaintops, and diving to the deepest regions of the ocean floor. Seymour Simon, the dean of children's science nonfiction, investigates Earth's biggest, smallest, deepest, and coldest environments, animals, plants, and most severe weather. These mind-bending facts and photographs invite readers on an exciting, and sometimes unbelievable, scientific expedition of Earth's most amazing records! What I Think: I had the pleasure of meeting Seymour Simon at NCTE last year and he's such a wonderfully nice man. I met him and his wife and was able to talk to him about non-fiction. I told him about Peanut and how every week Peanut came home from school with another book from his school library - and it was always non-fiction. I really thought his teacher was encouraging him to check out non-fiction. It turned out the kid just really loves non-fiction. We read a mix of books in our house but it was neat to see how when it was totally his choice of a book to check out, he wanted a non-fiction book. I particularly like Extreme Earth Records because it's like reading little articles about fascinating places all over the world. Each topic gets 4-5 pages with photographs and texts. Seymour makes lots of great connections and helps bring each of these places to life for readers. From a mentor text perspective, I used this book to study introductions with a class of middle schoolers. We focused only on the introduction of each part of the book. We read each and thought about what Seymour was doing in each. Sometimes he asks questions, sometimes he describes the place and give facts, other times, he asks the reader to imagine. In looking at the different introductions, we were able to recognize these patterns. As we read the introductions, one student kept answering Seymour's questions and I pointed out that a great introduction really makes the reader think. It makes the reader's brain want to answer...it makes the reader's brain not be able to help but think and answer the question or imagine what has been asked to be imagined. 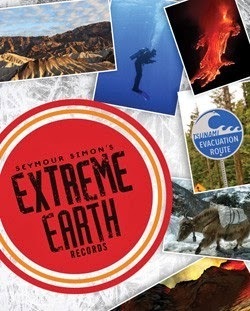 Using Extreme Earth Records as a mentor text is a nice way to introduce how writers can get started with an expository piece. Students can then write their own introductions using one of the styles they noticed in the book. As students read more and more non-fiction, they can look for ways that other authors hook their readers and bring them in to share with the class or put into their notebooks as an idea to try when they write expository. Writing Prompts: After looking at the different ways that Seymour Simon hooks readers, write a few of your own introductions that mirror his style.